July 2012 - Magnolia Creative Co. I had planned a very fun new tutorial but my Sunday craft day quickly became a “Mommy and Me” day. I took my sweet girl to see Brave. It was great but we did have to take a little break and walk out during one scary scene involving bears. She said she wanted to go back in and was fine the rest of the movie. She’s such a little trooper and we had a great day together. 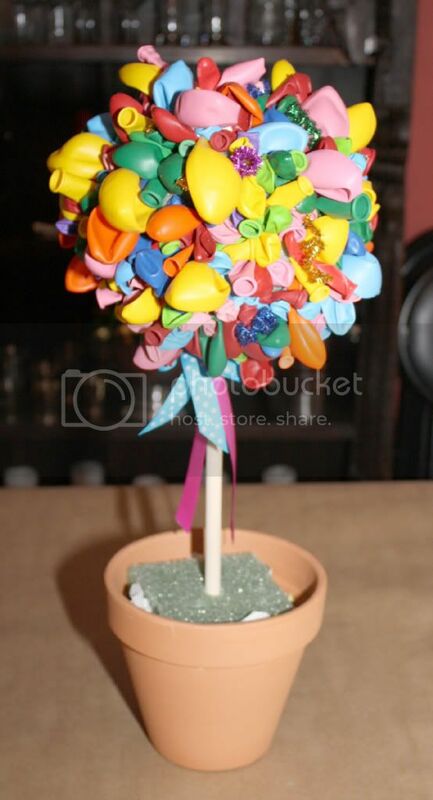 So instead I’m re-sharing a fun tutorial I posted a while back – Balloon Topiaries. I made these for Audrey’s 3rd birthday – an art pARTy! I’ve reused these so many times and put them in different containers. I’m looking forward to remaking them at Christmas using red and green balloons. Two packs of greening pins. You really use about 1.5 packs but it’s better to have more and not need them than be short. Cut your styrofoam block to fit inside the terracotta pot. Slide the dowel through the block and then into the ball to form the topiary shape. 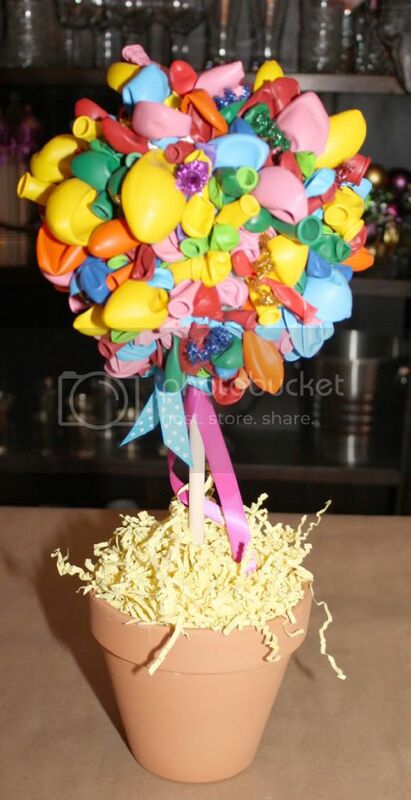 Next it’s time to add the balloons to the styrofoam ball. 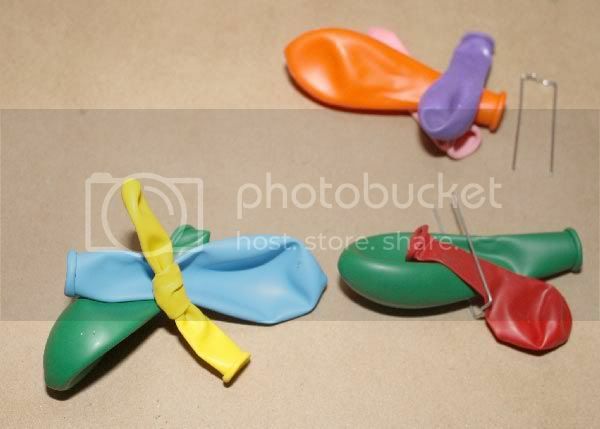 I tied one of the smaller balloons around the greening pin (yellow balloon) to help hide it. Behind the yellow balloon I placed one or two of the larger balloons. Push the greening pin into the ball. Do this over and over until the entire ball is covered in balloons. 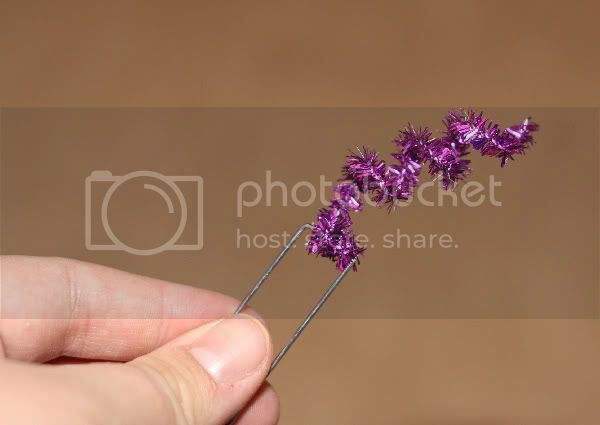 To add extra texture cut the pipe cleaners in half. Wrap one end around the greening pin to hide the edge. Wrap the other end around a pencil or paintbrush. 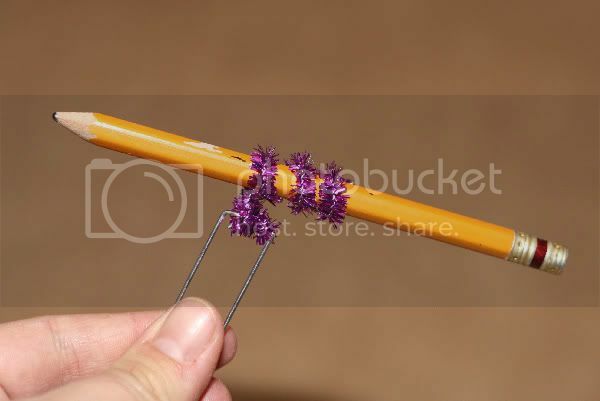 Pull the pipe cleaner off and stretch it out into the coil shape. Add these sparingly around the ball. 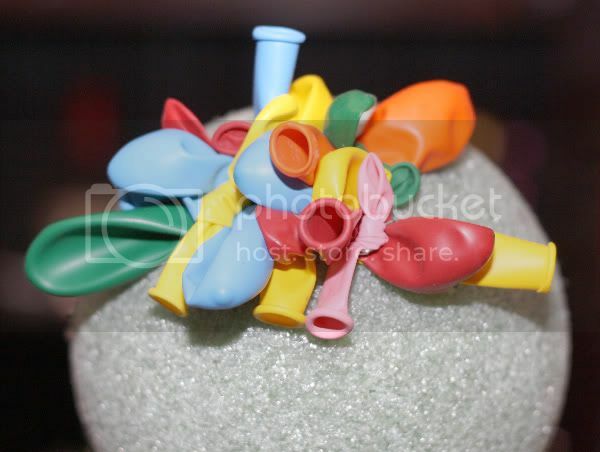 You can also add balloons behind the pipe cleaner like in step 3. 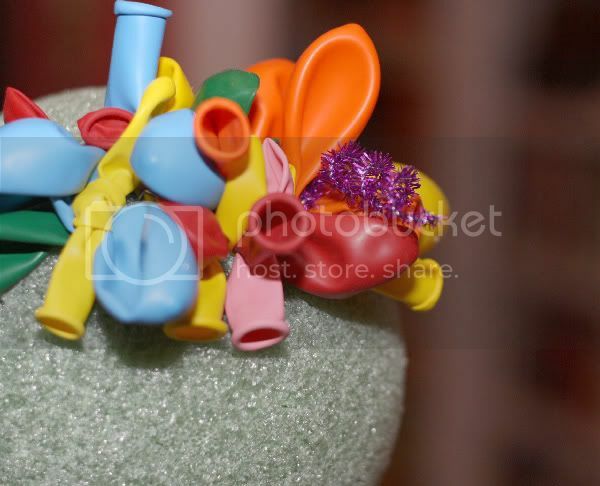 Continue covering the entire ball with balloons and pipe cleaners. For added decoration tie some ribbon around the dowel at the base of the styrofoam ball. To cover your styrofoam block add the shredded tissue on top of it and around the dowel. Congratulations, you are done! 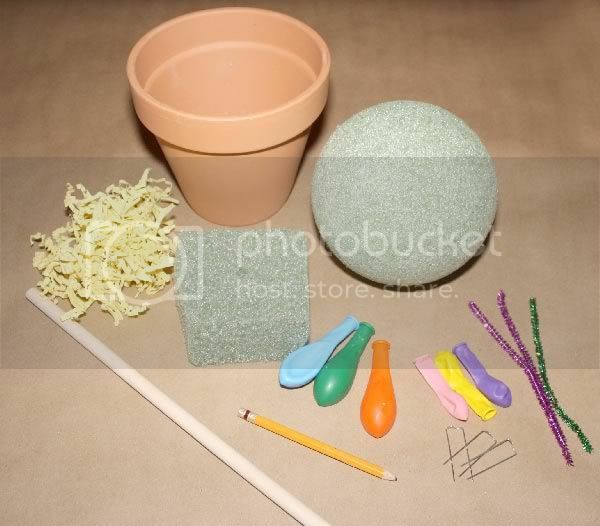 These topiaries make great additions to any table because you can change them up by using different colored balloons to match a theme or holiday, paint the dowel and use interesting ribbons or changing up the containers. 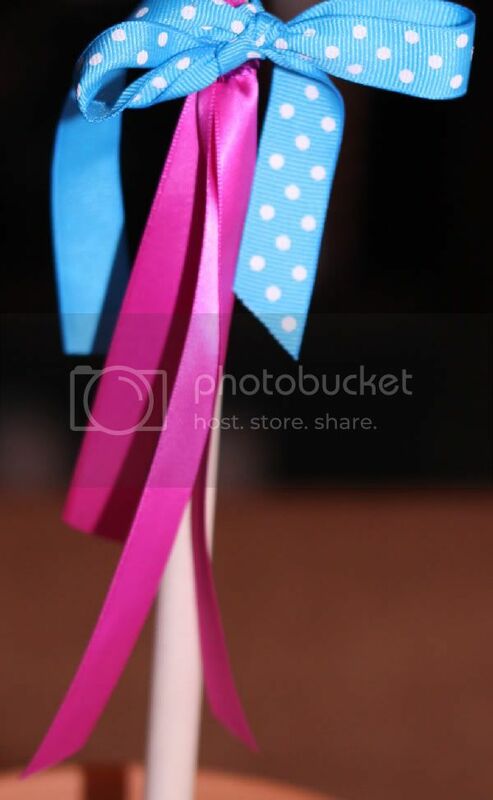 You can also just make the ball and hang them from a chandelier or the ceiling using coordinating ribbon. Have fun! extended through the end of the month. First off today – Storewide Sale to celebrate Christmas in July! Now is the time to get that new cell phone case or cake pop stand or take advantage and stock up on the new perfectly matched stationery and stamp sets, they make great gifts! Sale ends Friday so start shopping and saving now! Next I’d like to share a very sweet and shabby chic party I had the pleasure to work on with my party partner in crime, Amelia from the styling blog, Her Royal Heinous. This was the first party where I got to debut a new die cut invitation. This style will be coming to the shop soon, just in time for holiday cards! However, this new Vintage Shabby Chic collection is in the shop now! When our client (and close friend) called us about doing her daughter’s first birthday, she had some specific ideas, she was looking for a girly “Shabby Chic” party. The color scheme was based off a fabric banner Her Royal Heinous had done for an Easter Tablescape featuring pinks, yellows, light browns and pops of teal. The invitations were die-cut and designed to be sweet and girly, just like the birthday girl. The client wanted her monogram to be a prominent feature – which we carried into several other components, including the oversized quilted monogram centerpiece that matched the shape of the die cut invitation. She also had pinned several styles of rose cakes, so we ordered a 10” cake from Aly B’s, along with cupcakes and cookies in shape of “1” for favors. The wafer flowers were purchased in three complementing colors and gently placed on the cupcakes for a beautiful decorative touch. Cake plates and candlesticks displayed the cupcakes in a subtle manner. Then teal blue tins of baby’s breath, tulips and daisies created the perfect pop of color. Wooden spoons and forks were purchased and hand stamped with the birthday girl’s name and an additional fabric banner was used to drape the high-chair and create the perfect pictures of Avery eating her first cake. Fabric scraps from the banner were used to wrap mason jars for flower arrangements. Finally the main table was draped in an eyelet lace fabric with a soft pink underlay and the fabric banner, then framed by giant pink and teal lanterns. The centerpiece was created with an open back frame set into plaster in a planter. The monogram was printed and then hand-sewn with thin teal satin ribbon to the pink quilted backing and the base was filled with bay’s breath. Other details include: frozen water balloons used in the drink bucket, a “1” candle that was bedazzled with stick on pearls and crown candleholders that were spray-painted white and used to hold flower arrangements. Fabric tulips form the Michael’s dollar section were used liberally throughout the yard to continue the color scheme in a very fun way. The day was beautiful, the party was a huge success and that made for one happy, happy family. Invitations, cupcake wrappers and other party pieces: Magnolia Creative Co. I don’t know if it has to do with the summer or the recent season finale and popularity of Swamp People but there has been a massive spike in sales of my Swamp Party Collection. I created this collection for my son’s first birthday and the party was featured on Kara’s Party Ideas. 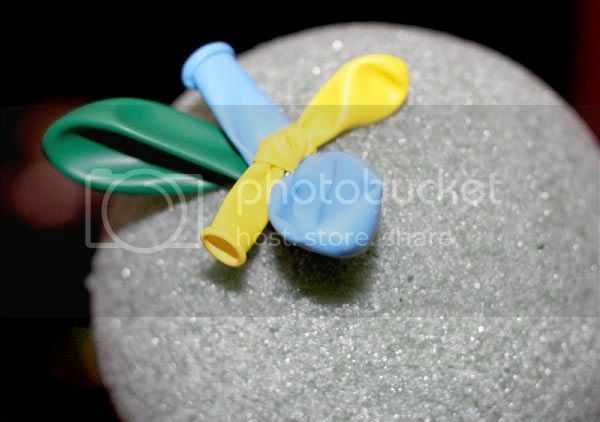 The party favors for Jackson’s party were push pop containers filled with SLIME! The big kids loved them and so did the parents because it was not toxic, edible (but not very tasty) and it won’t stain clothes or hands! It was so easy to make and could be dyed any color to match any party theme. I found lots of instructions and this recipe seemed easiest and required the least amount of cooking. 1. Add 1 1/2 cups of water to a small saucepan. Heat until the water is warm but not hot or boiling. 2. Pour 1 cup of the warm water into a bowl. Add 5 to 6 drops of green food coloring until the water is about a shade darker than you want the slime to be. Mix the water well with a spoon. 3. Measure 2 cups of cornstarch. Place it into a separate large-sized bowl. 4. Slowly empty the colored water into the bowl with the cornstarch. Use your fingers to mix the ingredients together. This is a fun activity for kids to do as your little helper. Thoroughly blend the mixture into the consistency of a thick paste. 5. Regulate the consistency of the slime. You can add more cornstarch if the slime is too thin which I did do. Add more warm water from the amount remaining in the pan if the mixture is too thick. Just keep doing this as much as needed to obtain a mixture that is of the right slimy consistency for your needs. You should be able to put your fingers into the mixture easily. When you run your finger along the slime’s surface, it should feel dry. I placed my slime into push pop containers and put a themed label around the outside. I ended up doubling the recipe to fill 15 push pop containers. You can place your slime in the same or any other air tight container or bag. These make great kid friendly party favors! Let’s Geaux Party put together another fun party with a competitive theme – the Olympics. It was held at a local pool so the mom wanted to do something that incorporated sports and games since they’d be swimming and the birthday boy is on the pool’s swim team. For the centerpiece table we purchased the felt pieces from Hobby Lobby and cut them into flames and constructed our version of the Olympic torch using some PVC pipe, a simple wooden base, gold spray paint and red and orange tissue paper. The “flames” looked great blowing in the wind. Their last name fit perfectly within the Olympic rings and made a great banner showcasing other countries flags. Dollar Tree again to the rescue for party favors! We found these great aluminum water bottles and personalized them with each guest’s name in white vinyl. The font on the bottles matched the font used through the collateral and the 2012 Olympics. Guests also received a treat bag filled with sports themed candy also purchased at Dollar Tree. As an added treat you can support Team USA yourself by using the Magnolia Creative Co. FREE Olympics printables available here. Let’s Geaux Party is the team party venture from Emily Welch owner and designer behind Magnolia Creative Co. and Amelia Chandler from the styling blog, Her Royal Heinous. Together they are the only event company specializing in children’s parties in the Shreveport/Bossier area. For those of you unfamiliar with our Louisiana slang, geaux means go. We had the opportunity to work with some great sweets creators and learn to plan a party in the 100+ degree Louisiana heat, it was an adventure even at 10am. I’m adding this Farm Collection to my shop today so look for it tomorrow! It will be available in printed and printable options with instructions on making the opening barn doors on the invite and the centerpiece sticks for the printable version. So without further ado….let’s geaux to the farm! The party was for a set of twins turning four and their little sister turning two and held at their grandparents farm in Greenwood, Louisiana. Despite the extreme heat everyone had so much fun and enjoyed the petting zoo that came to visit the kids. The mom wanted a hand drawn illustration of the farm animals with a sort of “story book feel”. We took the invitation a step farther by having the barn doors open to revel the invitation wording. We set the very long dining table and lunch up inside the motor coach “barn”. The cake and drinks were set up inside the actual barn complete with a stable right inside and behind the cake. It made for some very amused guests who were greeted by horses whenever they went to get a treat. Amelia scoured the local thrift shops for cowboy boots for centerpieces, some she painted and some were left to their vintage feel (inspired by Orange Blossom and Stephanie Lynn). 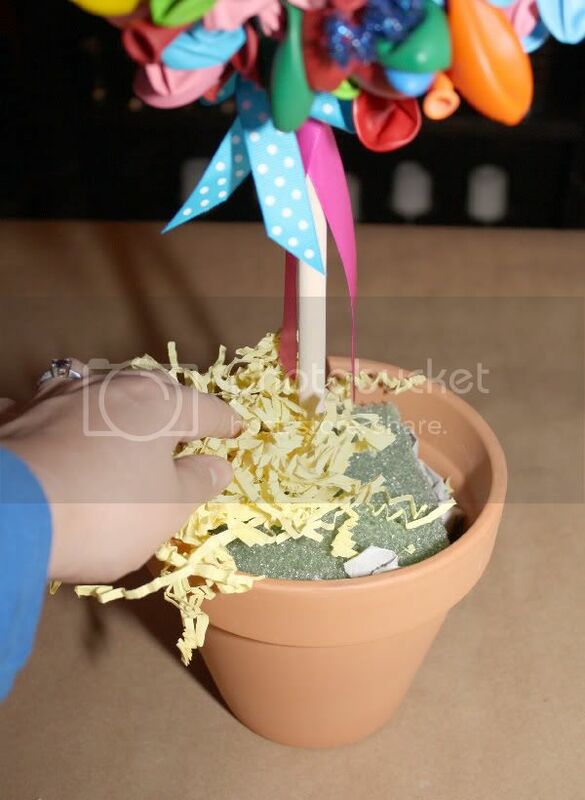 We set up small hay bales and sunflowers on the table with toppers made in the same style as the party invitation. Horse head bookends were also used to add to the western feel. Lunch was served out of a “chuck wagon” packaged in kraft gable boxes and topped off with a delicious animal cookie from Frog Prince Cake and Cookie Design. Aly B’s Bakery in Shreveport made the delicious farm cake topped off with fondant farm animals from Two Sugar Babies. We also added a hand maid denim, burlap and gingham cake bunting behind the animals. Cupcakes were purchased from Sam’s and topped off with cupcake toppers to match the rest of the party collateral. Each child received their own western cowboy hat hung on the fence (inspired by Hickey Pickety) and a chance to shop at the “General Store” for fun treats and toys. All the children got to ride on the donkeys and horses, pet goats, sheep and ducks and ride in a special barrel train owned by the grandparents. I think the kids had almost as much fun as Amelia and I had putting this party together. We had a blast down on the farm! Amelia Chandler: Her Royal Heinous / Emily Welch: Magnolia Creative Co. I am so excited to release this product! Our exclusive design is unique and the only perfectly matched stamp and note set currently on the market today. Set yourself apart by choosing your own design, font and even stamp ink color. Your self inking stamp will match your stationery design down to the font and graphics! Custom designs are available as well. Magnolia Creative Co. will work with you every step of the way to create a set that is as unique as you are! Coordinate in every way with this personalized stamp and stationery set! And like all the other new products that have been released over the past couple days I’m giving away one set for FREE! I hope you’ll enjoy this products as much as I do. They make great gifts for your friends, teachers, your children and of course, yourself!